On Saturday, December 12, 2015, the Armenian Relief Society of Western USA, Regional Executive will host a special celebratory event on the occasion of the Armenian Revolutionary Federation’s 125th anniversary. The event will be held from 6-8 p.m. at the Glendale Adult Recreation Center, located at 201 E. Colorado St., Glendale, Calif.
Visit Red Top Market & Kitchen on Sunday, December 13 and 20 for its Annual Eat and Feed Fundraiser, whose proceeds will benefit the ARS of Western USA’s Heart to Heart Program. The generosity of individuals, schools, and the ARS Pasadena “Sosse” Chapter helped ARS Social Services ensure that numerous families in need throughout the Glendale, Hollywood, and Pasadena communities would enjoy a better Thanksgiving holiday. On November 24th, ARS Social Services distributed 100 frozen turkeys to clients, sponsored by Mr. & Mrs. Shahab and Nadia Shamsi. Chamlian Armenian School students & PSC Executive Committee members distributed full course Thanksgiving meals to five families most in need. Pilibos Armenian School students and the ARS Pasadena “Sosse” Chapter also brought their participation by donating canned foods. The ARS Regional Executive Board is proud to announce that ARS of Western USA member Nyree Derderian, and former Regional Executive Board members Maral Matossian and Rita Hintlian were elected to the ARS Central Executive Board during the ARS 71st International Convention. 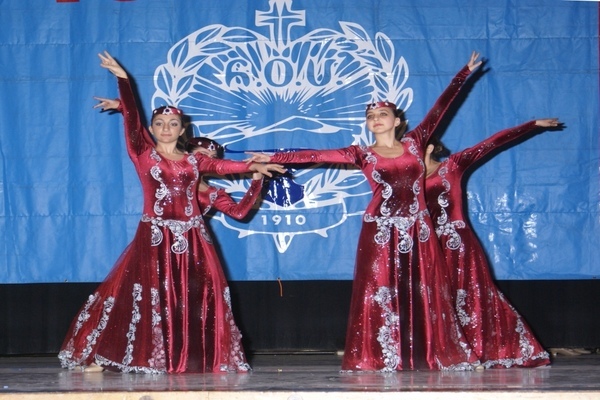 The ARS Glendale Sepan Chapter jointly organized an Armenian cultural night with the Hamazkayin Glendale Hovannes Toumanian Chapter on October 30, 2015 at the Glendale Youth Center. Guests enjoyed Armenian song performances by the ARS Sepan Chapter Saturday School students, as well as a display of traditional Armenian costumes. ARS Regional Executive Board members including Annie Bostanian, Carmen Libaridian and Maro Papazian presented a total of $17,000 on behalf of all ARS regions and members across the globe at the Armenia Fund Telethon on Thanksgiving Day, November 26, 2015. This year’s Telethon proceeds benefit the construction of single family homes for families with 5 or more children in Artsakh. ARS Fresno Mayr and Sophia Chapter members were present with Mr. Berj Apkarian, the Honorary Consul of Armenia in Fresno and Dr. Jeffery Thomas, President of the medical staff at Community Medical Centers in Fresno, at a presentation in Fresno on November 16, 2015 about the Armenian Medical Mission to Armenia. Three ARS members, Serpouhie Messerlian and Mary Ekmalian of the Mayr Chapter, and Nellie Kalemkarian of the Sophia Chapter were among the 25 volunteer member team that went to Armenia to provide training and care.